A recent Facebook meme asked one of those Who remembers these questions? Type “Like” if you do! They are typically: Do you Remember Bread Boxes? Tupperware? Clackers? or any number of things that were popular or invented during our ever-increasing life spans. The questions are asked, presumably, so that we find joy in being reminded of things that brought about a happy moment or sentimental memory. Often they just remind us that we are frigging old; we respond, but in our heart of hearts we just wish the 13 year olds who post these stupid memes just stop it. Sometimes the question is: do you remember something from your childhood that cannot be improved up. Yes, I do. 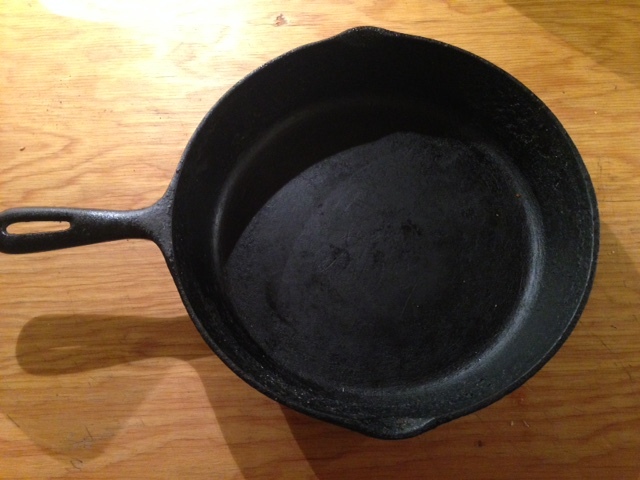 The cast iron pan. We are warned against Teflon-type coatings that can become carcinogenic at 500 Degrees Fahrenheit which is high but considering it’s a FRYING PAN, what are the chances that we would use them to just poach our eggs rather than fry them? Stupid carcinogenic frying-pan developers! We don’t read directions because we make stupid assumptions. How dare we assume that our pans, like the cast-iron frying pan, can be used at a high-enough temperature to cook our food WITHOUT GETTING CANCER?? 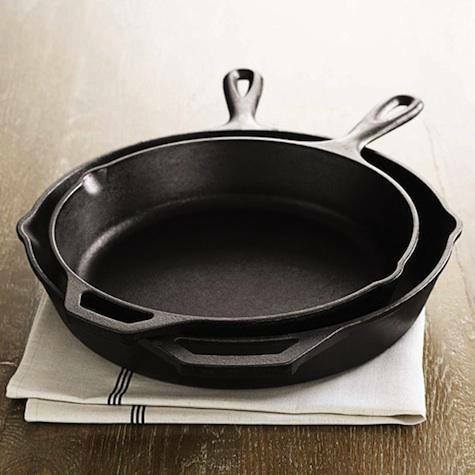 Forget the cancer bother, you can use a decades-old, oil-infused cast iron beauty that will let you flip eggs and toss beans with impunity, fry up grilled-cheese sandwiches and almost everything else without sticking! They need to be cured before use – infused with oil and baked in the oven so that the oil seeps into the pores of the pan. 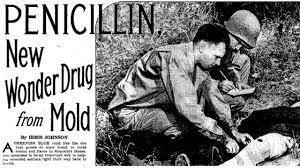 After that, you are NOT ALLOWED, on the pain of death, to wash with soap; if so, the curing will have to be repeated and you will be sent to Hell indefinitely. Some of these pans have been handed down for generations; just keep adding oil before you heat up and voila – you’re good to go. The most cleaning needed is some hot water and a dishrag; if crusty bits cling, tackle them with a rock salt/water paste. Be careful with scrubbies as they might remove the oil coating. My mother gave me this pan as a parting gift when I left home at 19. After 35 years she still looks pretty good for her age, don’t ya think? We call her Cheryl and she’s never let us down. Throw a bit of olive oil in her, heat ‘er up and she’s ready to go. The pan. This entry was posted in Ramblings and tagged cast iron frying pan, guilty vegetarian, never use soap, never wash frying pan, non-stick coating by budbug. Bookmark the permalink.